Traditionally, crepes are folded and/or shaped according to the recipe directions. However, there are many recipes that would work well with different types of folds. And since crepes are so versatile, once you have the basic crepe recipe down, you can use whatever ingredients and folds you can dream of! If you have an electric crepe maker, check out our ​Electric Crepe Maker Tips. Place the crepe with the best side down. Put the filling in a line down the center of the crepe. Fold the right side just past the middle and then do the same with the left. This method shows the filling at the ends. This is the traditional fold for a Cheese Blintz. Place the crepe best side down. Spoon the filling into the center of the crepe. Fold both sides over filling, then fold bottom and top. Crepes Suzette recipes use this fold. Place the crepe best side down. Spoon filling into the center of the crepe. Fold in half. Fold in half again forming triangle four layers thick. Rolled crepes are super simple to eat. Pick up with your hands, or cut up into slices! Spread filling over one side of the crepe (I would use the side that isn't as pretty) leaving a slight edge. 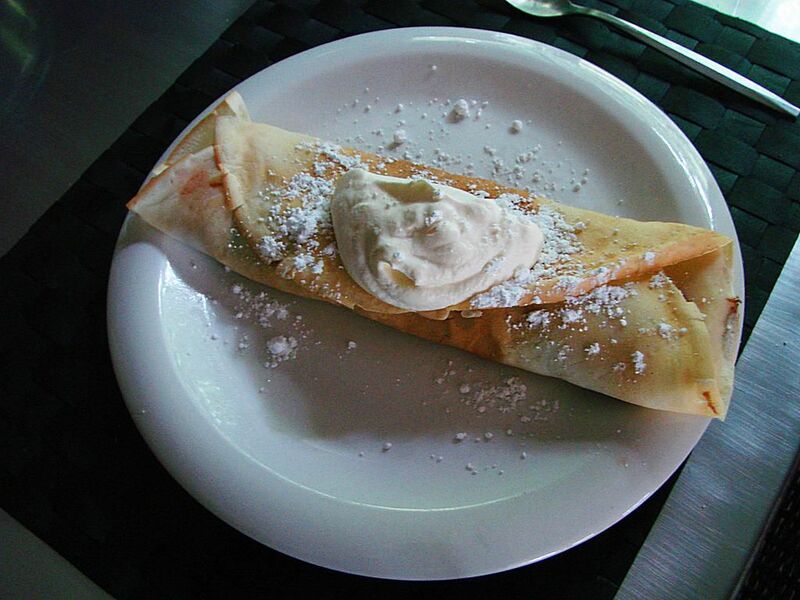 Roll-up crepe. Depending on the filling, serve sliced. Want a sweet lasagna? Try layering your crepes. Place the best side of the crepe down. Spread filling over crepe leaving a slight edge. Top with another crepe and cover with filling. Keep repeating for a lovely layered dessert. You can even make it with savory ingredients for dinner. Cut and serve in wedges. Peach Crepes - Breakfast Fare or Dessert? What Does the Word 'Bourguignon' Mean in the Culinary Arts? Do You Know How To Make French Dressing at Home? Find Out!